ORTELIUS -Presbiteri Iohannis Sive Abissinorum Imperii Descriptio. ORTELIUS, A. - Presbiteri Iohannis Sive Abissinorum Imperii Descriptio. Presbiteri Iohannis Sive Abissinorum Imperii Descriptio. - ORTELIUS, A. Title : Presbiteri Iohannis Sive Abissinorum Imperii Descriptio.. Size : 14.6 x 17.1 inches. / 37.0 x 43.5 cm. 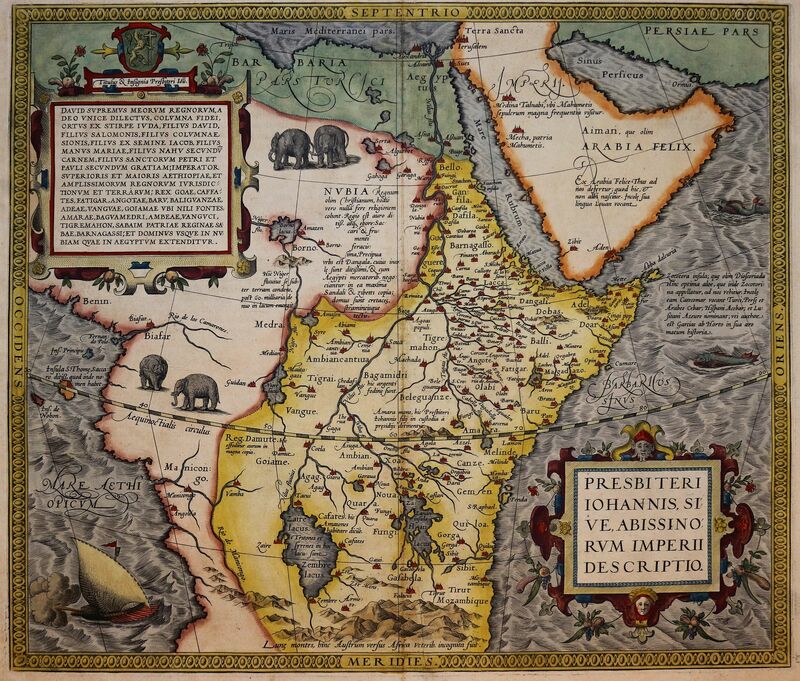 Description :Exquisite map of the land of PRESTER JOHN. A legendary King of the East who was supposed to help the Crusaders in their fight to reconquer the Holy Land and Jerusalem. It covers Africa from the fabled mountains of the moon in the center of the continent north to the Mediterranean. Only the Northwest of Africa is excluded. The interior, though largely imaginary, is filled with cities, lakes and rivers. Strategically placed elephants or captions are used to avoid blank spaces. Prester John: For centuries it was an article of faith among Europeans that a great and powerful Christian kingdom existed in Asia, separated from its co-believers by the forces of the Islam. If only they could join together, Christian armies could then destroy the Moslem empires. This notion was stimulated in 1177 when Byzantine Emperor Manuel I received a letter purporting to be from the ruler of this Christian Kingdom, Prester John. (Prester derives from the Latin presbyter or priest.) As European knowledge of Asia grew, the location of Prester John's kingdom changed until it was realized it could not be in Asia. Condition : In attractive older colours. Strong impression and wide margins. Some browning and foxing and wrinkling in margins and on verso. Superficial stain in right margin not affecting image. From a Latin text edition.